Rent river boat: ship, small ship or boat. We are making events on the little boats for several years now, and we have a separate section for that on the site, where you can learn all the details about the ship or the boat rental in Saint-Petersburg. Of course, it’s also TRAMs, on the river though :). Please note that we have available all the ships that are physically present in our city, as we also deal with the shipping companies of the city. Another plus – we offer the best prices for the rental of the ship. Balloons to every client. Offer extended for the whole of July! Dear guests, we offer you the balloons decoration of any room: house, restaurant and transport. Balloons for the wedding and birthday, in the restaurant and outside, just under the ceiling, or in complex shapes: arches, hearts, rings, etc. Salute from balloons any color and shape (including foil balloons). 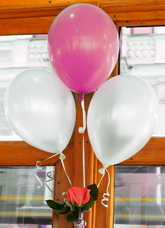 Throughout June, a 10% discount for decoration with balloons, for orders from 5,000 rub. This entry was posted in News on June 1, 2013 by admin. We are now in Moscow! Our dear guests, the good news, the company Event TRAM.ru creates unique events now and in Moscow! To order the original wedding, fun children’s holiday, unusual tours, corporate party in Moscow, please call or fill out the form and we will contact you. On the next special projects in the capital we’ll be posting more information later. This entry was posted in News on May 10, 2013 by admin. Would you like a discount? It’s Easy! All participants of the advertising campaign “Wonderful tram” receive 5% discount on the rent of a TRAM or Trolley! 2. Under the photo indicate an active link to our site and a description of our services. 3. Add us to your friends in social networks, Vkontakte, Twitter or on Facebook. 5. Send to our e-mail message with a link to a page where you have placed our information (in the subject line write “Alert!”). Once 5 of your friends will be added to our friends, and the photo with the link will appear on your page, you will immediately receive a discount! This entry was posted in News on April 25, 2013 by admin. Graduation at the light rates! If you make an order (signing contract) of the “turnkey” graduation event or take one of the ready-made “package” proposals until April 30, you receive a discount of 10% of the total cost. The date of event may be any according to your wishes, order (signing the contract) must be made by April 30, inclusive. Ready packages are suitable for graduation from kindergarten, for 4 graders, for high school students 9, 10, 11, students and graduates of universities and secondary schools. Programs are held in the TRAM, Trolley, MagicBus, on ships, in-dash or on your site. More detailed information you on graduation events you can find here. This entry was posted in News on April 1, 2013 by admin.